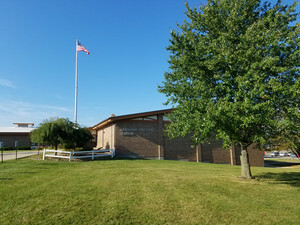 Abraham Lincoln School is located at 2625 14th Avenue in Monroe, Wisconsin. We have a caring staff serving approximately 300 4K-5th grade students. We are proud to foster a compassionate learning environment with high academic expectations for ALL students. Every day, we build relationships with our students, families and community. Abraham Lincoln Elementary School fosters a compassionate learning environment with high expectations in which all students can grow and achieve. Abraham Lincoln Elementary School will work collaboratively with students, families and the community to build relationships and together we will prepare all students to succeed. Respect- We will value and care for students and staff in all situations. Encourage & Educate- We will be a positive example, beginning each day with a fresh start in my interactions with everyone. Accept & Act- We will understand our school culture starts with me and I will take responsibility for being an active part of the school team. Collaborate & Communicate- I will build positive relationships with students, staff, and community. Help- I will demonstrate a positive attitude toward problem solving solutions.